Sound Transit has opened its online open house for you to learn more about the SR 522/NE 145th Bus Rapid Transit (BRT) project and share your thoughts. It will be live until June 13. If you'd like to learn more about the project in-person, come to the Thursday open house at Brookside Elementary school. 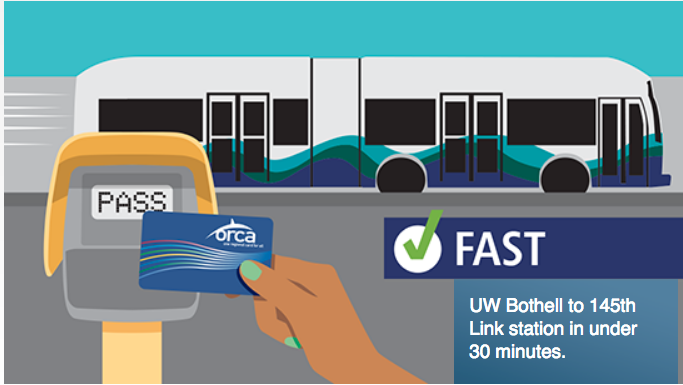 The SR 522/NE 145th BRT Project will provide fast, frequent and reliable bus-based transit service from north Lake Washington communities to the new Shoreline South/145th light rail station. Riders will be able to transfer between the SR 522/NE145th BRT, I-405 BRT, Link light rail and other transit service provided by Sound Transit, Community Transit and King County Metro. Approved by the region's voters through the Sound Transit 3 plan, the representative project includes nine stations in the north Lake Washington area, with stops in Seattle, Shoreline, Lake Forest Park, Kenmore and Bothell, with every other trip running to Woodinville. Through this project, Sound Transit will also build additional parking in Lake Forest Park, Kenmore and Bothell. Planning for this project is underway and your participation is important. To start construction as fast as possible, the project team has established an ambitious planning and environmental analysis timeline. Throughout 2018, staff will engage with neighboring communities to learn about their priorities and ideas for the project. It's critical for the community to engage during this early project development phase, as this feedback will help shape the refined project. What they don't tell you is, you have to give up your zoning density for a slightly faster bus route. Sound Transit are land-grabbing tricksters.